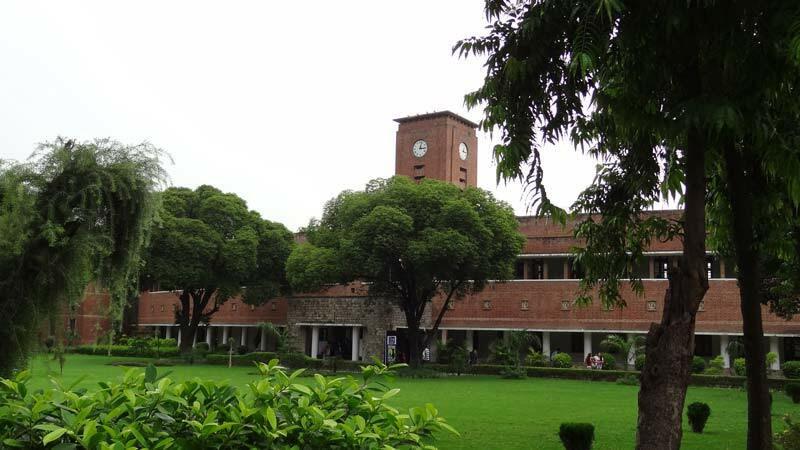 Shri Ram College of Commerce (SRCC) Delhi – A brief History : Shri Ram College of Commerce popularly known as SRCC is a Delhi University affiliated college. The college has been consistently ranking as India’s top commerce college. The foundation stone of SRCC was led in 1920 as a school and later in 1926 it turned in to college when Shri Ram College Commerce got affiliation from University of Delhi. In 1932, the College was upgraded to the status of a Degree College and began awarding its graduates the B.A. (Pass) (Commerce Group) Degrees of the Delhi University. The B.A. (Hons.) Degrees were introduced in 1943. Closely on its heels, the same year saw the entry of M.A. (Economics), and in 1948 M.Com was introduced. In 1949, when Delhi University began awarding B.Com (Honours) Degree, teaching the course seemed to be natural task of the College. The B.A. (Hons.) Economics was introduced in 1958. It was in 1951, on SRCC‘s Silver Jubilee, the College decided to convert itself into a Commerce and Economics only College and also gave itself the present name Shri Ram College of Commerce (SRCC) in recognition of the contribution made by its founder – Lala Shri Ram. Shri Ram College of Commerce (SRCC) Delhi – Courses and Fees Details : SRCC is a Commerce & Economics only college and therefore it only offers Commerce and Economics courses along with PG diploma in Global Business Operations (GBO). B.Com (Hons.) is the most popular course that SRCC offers. B. Com (Hons.) is a three Years – Six Semester (Full-time course). Shri Ram College of Commerce has 501 for this course. These seats include 27% (135) OBC Seats, 15% (75) SC Seats and 7.5% (38) ST Seats. In DU Admissions 2015, the University clearly specified that gap year(s) would be no bar for purposes of admission to the undergraduate courses and SRCC is no exception to this. The fees for this course is roughly around Rs 30,000 per year. B.A (Hons.) Economics is one of the most sought after courses in Delhi University. Students enrolled under this SRCC Course are required to take twenty one economics subjects across six semester.Out of them nineteen are compulsory and two subjects are optional. The fees for this course is also around Rs 30000 per year. Apart from these SRCC also offers Postgraduate Courses, M.Com and M.A. (Economics). SRCC is one of those Delhi University colleges which usually keeps their cut offs more than 95%. Over 10 lakh students apply every year for Commerce and Economics courses in DU every year with Shri Ram College of Commerce as their first priority, it becomes understandable why SRCC cut off are sky touching. You can download the previous year SRCC cut offs from these links 2015 2014 2013. The SRCC cut off 2016 are also going to be very high. Its highly unlikely that they’ll be less than previous ones. The college has a number of student societies like History and Political Science Society, Dramatic Society, Debating Society, Enactus etc. A number of Extracurricular Activities are organized by the college societies every year. SRCC CROSSROADS – the annual cultural festival of Shri Ram College of Commerce is very well known. It is one of the most popular students’ festivals in the Delhi University and in India. There is a long list of SRCC Notable Alumni. Below are the names of a few of them. It is my dream college.